The Cheetah Route runs along Mangaung, Botshabela, Thaba-Nchu and Ladybrand. The first three towns form the Mangaung Metropolitan Municipality. Mangaung is the capital city of the province and it has resulted in the route being famous for business, medical and educational tourism. The Cheetah will forever be at the apex of history as it was the birthplace of the ANC an d other political parties, which make this route rich in history and heritage of the country. The seat of the provincial Legislature and capital of judiciary as the Supreme Court of Appeal is situated in the famous historical and architectural President Brand Street. The city also pride itself of being the home to top flight sporting teams from football (Bloemfontein Celtics), cricket (VKB Knights) to rugby (Toyota Cheetahs). The route pride itself of being the birth place ANC and other existing and defunct political parties. One of the Presidents of the ANC, Dr JS Moroka was born and resided in Thaba–Nchu – he was the President of the ANC from 1949 – 1952. The President Brand Street, is famous for its architectural building which are today used for seat of legislature, museums and seat of Appeal Court. Lekgalo la Mantsopa, where the legendary Basotho Prophet Mme Anna Makhetha Mantsopa resided in Ladybrand is today one of the major tourist attraction along the route. There are quite a few museums found in Mangaung that provide the history and heritage of the area. The centrality of Mangaung and the ability to host conferences ranging from small to large gathering has made the route one of the ideal business tourism destination. The fact that Mangaung is accessible by road, air and railway make it also an ideal area for business tourism destination. Major medical institutions are found in this route and the University of the Free State Academic Hospital has made a number of ground breaking medical discoveries. Mangaung, boasts itself about the very first digital planetarium in Sub-Saharan Africa. The planetarium was officially opened in November 2013. The Naval Hill Planetarium was established by the University of the Free State with the support of the Department of Science and Technology, DESTEA and Mangaung Metro Municipality. The Central University of Technology has also brought first technological techniques that predicts drought patterns using the indigenous knowledge and IT techniques. The university also developed a solar mobile phone charger that is utilised by students at the campus. DID YOU KNOW ABOUT THE FREE STATE? The Maphikela House in Bloemfontein was home to Thomas Maphikela one of the founding members of the African National Congress and the house is still excite? That the African National Congress (ANC) was historically founded at the Wesleyan Church in 1912, the Church also hosted the ANC’s centenary celebrations in 2012? Franklin Game Reserve at Naval Hill in Bloemfontein is one of the only two Nature Reserves in the world that is situated in the middle of the city? Bloemfontein can claim the honour of being the first city in Sub-Saharan Africa to have a digital planetarium? R.R. 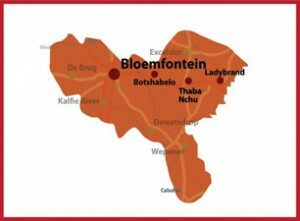 Tolkien, the famous writer of the movie Lord of the Rings was born in Bloemfontein in 1892? That Phakisa Freeway is the only motor racing track with a speed way track outside the United States of America and is regarded as among the fastest motorcycle tracks in the world? The world’s smallest Church that seats only eight (8) people is found in Harrismith? Petrified tree, which is estimated to be 250 million years is found near the City Hall in Harrismith? The oldest fossilised Dinosaur eggs about 200 million years in age were discovered in Golden Gate National Park near Clarens? The Jagersfontein diamond mine is the largest man excavated mine in the world? Fauresmith is the only town in South Africa and one of the only three in the world where the railway rail runs down the centre of the main road? 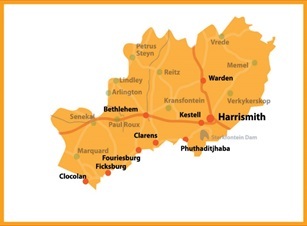 That Emmaus, a farm 20km outside Petrusburg is the center point of South Africa? Gariep Dam is the largest dam in South Africa and is constructed on the Orange River? Vredefort Dome, near Vredefort is the biggest meteorite impact that geologists have yet found on earth and is nearly twice as big as the impact that killed the dinosaurs 65 million years ago. It is also the oldest impact crater that has been found on earth. It is the seventh World Heritage Site? The NAMPO Agriculture Show is the second largest private agricultural show in the world – it attracts almost 70 000 visitors and nearly 700 exhibitors? Ben Nevis Farm near Clocolan was the first, and still the only registered cellar in South Africa producing its unique range of products made from cherries? The name “Memel” means ‘surrounded by water’ in the Old Prussian language, the wetland in Memel is the largest on the southern African Highveld. The wetland harbours a rich species diversity of waterfowl and other birds associated with water? The Holhoek Hiking Trail near Paul Roux is amongst the rare hiking trails in South Africa as it features a 4,3km wheelchair friendly route for paraplegics? The Clarens Brewery is the first and only microbrewery in the Free State and host of the annual Beer Festival in February? Tandjiesberg in Ladyband is one of the (12) twelve Rock Art National Heritage sites in South Africa? • Water sport of all kinds, from power boating to laid-back pontoon boat trips and fishing charters. • The annual “Round the Island” Yacht Race – South Africa’s biggest inland regatta. • The Deneysville Croc Ranch which has about 2,800 crocodiles and also farms emus. • An Olympic size swimming pool and world-class athletics facilities. • The Ettienne Rousseau Theatre which hosts a wide range of Afrikaans and other artists. • Gallery 88 which houses a stunning collection of contemporary South African art. • A bird sanctuary with up to 70 species of Highveld birds. • The Riemland Museum and Riemland Wine Route at Heilbron, an hour’s drive away. The beautiful town of Parys is situated on the banks of the Vaal River, and has become a firm favourite for both art and adventure lovers. With so many attractions, you’ll find it’s the perfect paradise for you. • 42 restaurants and a wide variety of arts & crafts shops. • Play a round of golf on Golf Island in the middle of the Vaal River. • Pick berries off the bush at Bon-Af Berry Farm and see SA’s only black raspberries. • Interact with the big cats at the Dell Cheetah Centre. • Visit Tumahole township just outside Parys – birthplace of Free State Premier, Mr Ace Magashule. • Head for the Vaal River or the mountains of the Vredefort Dome and enjoy nature from land, water and sky. • Spectacular rock formations, including the world’s only pink granite. • A wealth of plant, bird and animal life. • Water sport on the Vaal River. • A nearby Lion Breeding Programme. • A concentration camp and blockhouse from the Anglo-Boer war (1899-1902). • The Bloemspruit Monument for concentration camp victims. • A Garden of Remembrance for Allied victims of the two world wars. • Prehistoric stone corbelled huts. • San rock art and fossils. Golf on an 18-hole golf course. Interaction with lion and tiger cubs. Fishing on the Vals River or the Bloemhoek Dam. Boating on the Serfontein Dam. Horse riding, gliding, hiking and more. 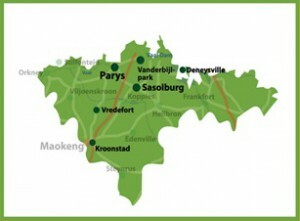 Koppies Dam Nature Reserve and Resort – 71km from Kroonstad. The Eagle Route, is known as the jewel of the province due to its scenic beauty, rich history & heritage, leisure tourism and adventure tourism. The route runs along the majestic Drakensberg Mountains that forms a pictographic landscape at the back drop of the Eagle Route. The picturesque landscape makes the route one of the most scenic area in the province with some of the government owned resorts and reserves nestled in this sandstone mountainous route. One and only life Basotho Museums is situated in this route – living the Basotho nations culture and practices from the 17th to the 20th century. For the adrenaline junkies this is the perfect place to visit, which features white river rafting, abseiling, horse riding, 4×4 and quad bike trails, hiking trails and safaris. Smallest Church in South Africa – significantly, the church accommodates only 8 people. Bird Watching with 250 species. The Springbok Route, is famous for the history & heritage that goes back to the 19th century during the Anglo-Boer War. The Route is also famous for adventure tourism, which includes breath-taking 4×4 and quadbike trails, water sport, gliding, horse riding trails and leisure tourism. The route runs along Jacobsdal, Koffiefontein, Jagersfontein, Phillipolis, Bethulie and Gariep Dam that was declared as municipality in 1994. Moth Museum – its memorabilia from various wars including Anglo-Boer War, World War I and II and Namibian Boarder War. Adam Kok House– Home of the world Griqua Leader. Transgariep Museum – exhibits the history of the area. The pulpit of the Dutch Reformed Church that was crafted from the Wild Olive wood, today the church stands a museum. Most of the building in the towns have been declared as national museum making the town a must see heritage town. Shell collection – laid down for the 366 people who died due to measles during the Anglo-Boer War. The area has an eco-tourism centre, known as Gariep Fish Hatchery – it is an opportunity to see how yellow fish, carp and barbell are hatched. The Flamingo Route, is known to be the bread bucket of the province due to its vast agricultural fields that produces maize. The area is also known for its produce of gold as the result of the discovery of gold in the 19th century. The effects of global warmin g that led to drought and reduction in agricultural produce and the decline of mining activities in the area as seen other economic sectors such as tourism is increasingly becoming key economic sectors for the region. The main offerings are combinations of variety of leisure activities, exploring a local gold mine, game viewing and visits to key historical sites. 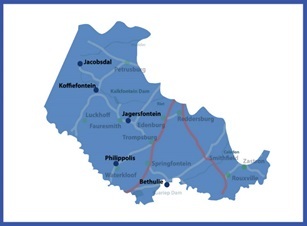 The route runs through Brandfort, Windburg, Virginia, Ventersburg, Welkom and Bothaville. Bothaville is considered to be the country’s maize capital, it is characterised by undulating maize and sunflower fields. The small town is the host to one of the most successful and the biggest international agricultural show – Nampo Harvest Show. The abundance of sunflower has seen the town being the site of the first ethanol plant in the country. Anglo-Boer War graves in memory of Cpt Dwyer. Vice-Admiral John Westerns house – design and build the 1st aircraft in Africa. Oldest Voortrekker cemetery in the country. Aandenk Monument – were the first borehole was drift in search of gold. Doornkraal Monument – honouring the Boers killed during the battle of Doornkraal. Tikwe Lodge Nature Driver – 40 species of buck, zebra, and giraffe, cruises along the Sand River.